Home NEWS DIVIDED HOUSE: Reasons why Justice Ndung’u and Ojwang’ differed with CJ Maraga. DIVIDED HOUSE: Reasons why Justice Ndung’u and Ojwang’ differed with CJ Maraga. 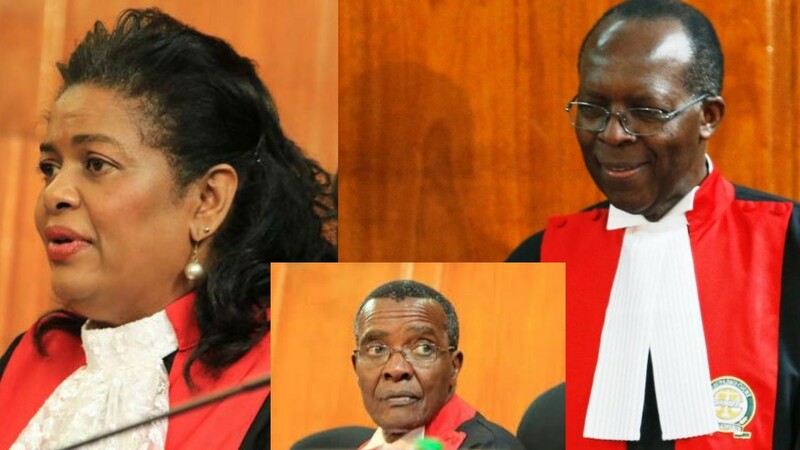 Supreme Court judges Njoki Ndung’u and Jackton Ojwang on Wednesday faulted the nullification of the presidential election before all ballots were scrutinised to verify claims of rigging. In their submission, the duo dissented with the majority decision to invalidate President Uhuru Kenyatta’s election, arguing that the will of the voter was supreme and that in the absence of evidence, a court must not overturn the people’s choice. They found that the majority decision was based more on conjecture rather than incontrovertible proof of – as Odinga alleged – a deliberate manipulation of systems to see President Uhuru Kenyatta emerge winner. Both Ndung’u and Ojwang found that the President of the Court David Maraga, his deputy Philomena Mwilu and Justices Smokin Wanjala and Isaac Lenaola were misguided in their application of the law as concerns elections. Justice Ndung’u argued that the Supreme Court, as the final verifying agent, had the authority to order a scrutiny of ballot papers, recount, re-tallying, and inspection of ballots. She expressed her satisfaction that the August 8 poll was conducted in accordance with the Constitution and election laws, discounting key parts of the evidence that informed the decision of the majority opinion. The judge, who said she analysed the entire evidence adduced by Independent Elections and Boundaries Commission (IEBC) against the NASA petition, stated that the disputed Form 34As used to declare the election were proper in form and content. She stressed that the court should have first made sure that the evidence presented was real and not imaginary grounds for concluding that the presidential results were not fair. “The court must be satisfied that the violations claimed are solid, not imagined. There was a verifiable paper trail which the court could use to verify the various allegations and which was not used. The effect of the judgement was to deny Kenyans their right to franchise,” Ndung’u said. Justice Ndung’u said that she conducted a comprehensive analysis of all the 291 Forms 34B (290 constituencies and Diaspora) and the disputed Forms 34A and noted they were proper. She argued that her analysis of 291 forms 34B (constituency tally) and the disputed forms 34A (polling stations results) did not establish widespread discrepancies, and that even where there were omissions, these could not affect the results of the election. “The role of the Judiciary is to give a comprehensible interpretation of the law rather than determine a dispute mechanically and dispose it off without proper evidence,” Ndung’u said. In her decision, the judge mostly focused on the rights of voters, arguing that elections are “rights- centric” and not “form-centric” and further emphasised that where the court is in doubt, inspection of the ballot materials was essential. According to her, there was no basis to reverse the will of voters and in the absence of evidence, adding that a court must not interfere with the people’s choice. She also argued that the majority’s heavy reliance on anomalies in the electronic transmission of results in their justification of the annulment was misguided as the Kenya’s election system is primarily manual with complementary electronic aspects. “Based on the disputed outcome of the 2007 elections, IEBC adopted technology in 2013. It introduced the biometric voter register (BVR) and electronic voter identification device. This year, Kenya Integrated Electoral Management System (KIEMS) was deployed. This is what the law says. Raila should not complain about technology,” she said. “KIEMS is only a complementary mechanism as envisaged in section 44 A of the electoral Act. Technology is not a mandatory component of elections in Kenya. It can only be used to add or improve electronic mechanism in Section 44 of the Act,” she added. She said in annulling Uhuru’s election, the judges did not look at section 44 A in its entirety. “Honourable justices in their majority ruling only partially looked at Section 44 A. They neglected the entire provision,” Njoki said. On his part, Justice Ojwang dismissed the ruling by his four colleagues, saying it failed to consider the Bill of Rights terming their analysis as political and not based on law. “This was a political decision. It is not a product of any juristic process. It was devoid of any legal analysis. In my considered opinion, judges should focus their attention on the intellectual and jurisprudence rather than emotions by the citizens and political agencies,” said Justice Ojwang. Among other reasons that led to his dissenting verdict, Judge Ojwang said that the petitioner failed to provide evidential proof that the results announced at the constituencies had irregularities. He added that the first respondent (IEBC) had declared all transmission systems functional at all points and the petitioner was unable to prove the electoral body violated the law. He further faulted the majority for rushing to make conclusion before thoroughly assessing the numerical basis of the entire voting, casting and counting of the results. The judge said the petition focused on a limited number of contentions which included the argument that the said presidential election was not conducted in accordance with the Constitution and that it was also compromised by certain illegalities and irregularities. The judges said they also overturned Uhuru’s victory because the election lacked integrity, therefore it ought to be invalidated. “Such claims invoke the question; how is the court to be guided?” Justice Ojwang said. Justice Ojwang said Raila failed to prove his case. He said the petitioner made ‘wide claims’ hinged only on one pillar of the electoral process — transmission of results. The judge noted that while the weight of the petitioner’s case lay on credibility, transparency and credibility of the results relaying process, NASA largely made broad claims on alleged wrongdoing on the part of the electoral commission. “Even though there were procedural challenges resulting from human errors, it was not enough to warrant nullification of the elections. I am of the opinion the majority decision failed to resonate with the Constitution. The case was not valid and was based on weak grounds,” Ojwang said. “The Constitution safeguards certain rights and values. It safeguards the rule of law, democracy and participation of the people. The law provides the court shall adopt the interpretation that most favours the fundamental rights,” argued Ojwang. He noted that however profound a legal argument might be before the court, it must be anchored on the facts of the case. The evidence need to be credible, not objective unless it is from an expert witness, he added. On whether the election was compromised by intimidation and the compromise of voters as argued by NASA, Justice Ojwang’ opined that the petitioner failed to accompany satisfying evidence, and in essence, undermined the discharge of burden of proof. The respondent, the judge said, did not contravene any provision of the Constitution or any other statutes of law. He said the IEBC conducted the elections in a free, fair and transparent manner, including consultation of parties, secret voting, as well as the counting of results in the presence of all agents as required by law. The judge noted that it was, therefore, prudent for the majority judges who ruled against the respondents to have asked for a recount of the votes before annulment. The voter, he argued, had no problem marking the ballot, which was secure, transparent and accountable. “The majority judges appear to have taken leave from their juristic obligation to interpret the constitutional provisions cited by the petitioner,” said Justice Ojwang’. “The Supreme Court, which is taking such an interpretation just like any other court, is under obligation to promote values that underline an open democratic society based on human dignity, quality, equity and freedom. The court, in its decisions, should always promote constitutional values, rule of law, human rights, and fundamental freedoms as spelt out in the Bill of Rights and good governance, he added.